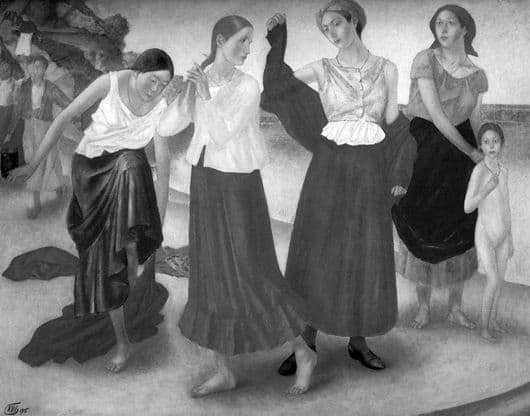 The painting “Girls on the Volga” was a discovery for the artist who discovered the world of “everyday life”. Admitting later to the writers, having tried an unusual style for themselves, he was keenly interested in the joys and difficulties of “ordinary” people. The canvas harmoniously depicts girls who are out of breath, descended from the path. As if dancing, they are preparing for games in the river. One girl braids a braid, caring for herself. This subject reflects all superstitions of the people. The Slavs had numerous traditions, where the spit possessed mystical powers and was a sign of honor. To weave it on people means a transition from a girl to a married woman. Another girl takes off her top skirt and other clothes, getting ready to frolic in the water. A little girl is waiting for her elder friends and mother, who has carefully taken the baby to the side. On the slope you can see two more figures running along the river bank. The artist sought to convey everyday moments with his subtlety. At first glance, one cannot say that they are peasant women preparing for bathing. The process is more like ritual dances: graceful poses of hands and body, beautiful legs. The viewer can fully enjoy the aesthetic process of preparing for bathing. Even the graphic quality of the means used by the artist does not interfere, but on the contrary looks harmonious. The perspective of the plot, where the four girls look three-dimensional, while the background remains flat and somewhat theatrical, is also chosen unusually. Very complex colors are also used, which, if used improperly, can spoil the plot. Red, blue, yellow and green allows you to make a picture of pastel and soft. It resembles some ancient frescoes and the manner of drawing of antiquity, where movement and life in poses were mainly transmitted.